Fresh spurs another surge of trout. 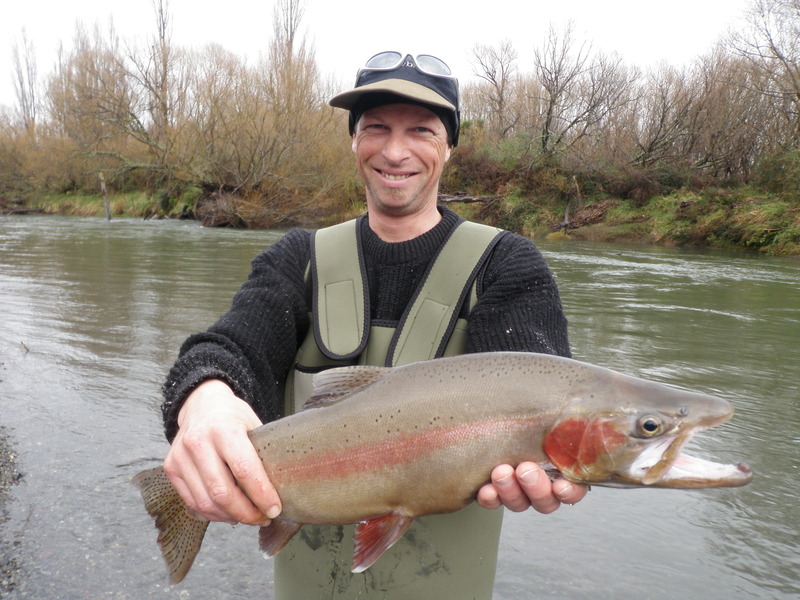 Fishing conditions for spawning trout at the moment are nothing short of perfect and have remained this way for a few days now with wetÂ overcast conditions and finally enough rain to dirty the river system. Friday was constant drizzle on the river and you could feel the pressure dropping in the air which bought through the wet front we needed which resulted in heavy rain on Friday night. Saturday the river was dirty and looking perfect to fish and anglers were making the most of the conditions early in the morning but as the river became higher many anglers retreated to log fires and cups of coffee. This is the best time to be fishing guys, not sat in front of the fire wishing the river would drop and become clear again! The fish are still in the river and would have been coming up at a rate of knots with all natural defences down, dirty water is the perfect time to ambush spawning trout. Trout are smart buggers and will shoot through the system without you getting to have a go at them so locate them and do your best to fool them as they will go through undetected if you are not out to try for them. Fishing is easy when the river is up and dirty as fish will be at your feet and can be caught on very large bright glo bugs or big dirty black wet flies. They will travel fast in the dirty water and hug the slower water at the edge of the river and use the river bypasses to climb high up the river fairly quickly avoiding the main current. Wet lining for big brown trout in places like the Bridge pool or the Hydro can be very effective with dirty water as there defences are down and minds set on filling their stomachs. AÂ few browns are still coming up the river but the majority of them seem to be in the 5lb range instead of the larger fish we saw all summer. The lower river again has been very popular over the weekend with anglers and it seems that more and more anglers are heading down that way and trying water they have never seen before. The lower river has always held good fish but it is quite hard to access in some places and is home to hundreds of fly hungry snags. Last week a heap of fish were caught in the area of Delatours, so I will assume these fish will be well above the bridge by now and may have even hit pools like Admirals or the Stag. With Saturdays small flood and another surge of fish from the lake the lower reaches below the bridge should have plenty of fish once again. Basically the entire river should be fishing well thanks to the perfect weather conditions which has encouraged fish to pulse up all week and over the weekend. While guiding on Friday in the Reed pool there were a heap ofÂ fish pushing through slowly which were easy to spot on the sandy bottomed edges. Some fish were acting very much like they were only interested in one thing as they were digging in the sand and the males chasing each other away from hen fish which were dropping eggs. Standing on the bank and casting to fish was something new for me as usually in the this stretch of water the best lie is on the true left where the pool finds quite deep water. We picked up a few fish by casting glo bugs in front of them and forcing angry jacks to snap out of getting sick of seeing the bloody thing every 5 seconds, so predictable. 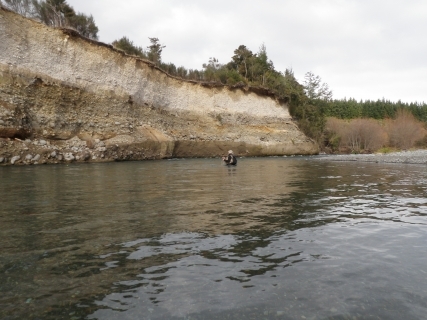 Sunday I enjoyed half a day with Andrew from Waganuie again in the lower Tongariro trying to locate fresh fish that had followed the flood up. Andrew had not fished before and had not caught a trout on fly before but was very keen to be introduced to the sport and get of to a good start. Casting was deffinitley a weak point and I must admit I did have to go for a walk by myself from time to time to regain composure. Finally the little fella got it and started shooting line well enough to achieve a decent drift and begin looking like we were going to get there. Towards the end of the session he hooked and landed his first fish which just happened to beÂ Â a 5 and half pound jack which gave a solid scrap but eventuallyÂ was Â beaten by the goodies. Flood gates and confidence opened and he went onto land another 3 fish which was really satisfying for us both. Had a really early start this morning(monday) down Graces Rd with Mike Hughes in hope that some of the fish from the fresh would still be pushing through and holding in the obvious lies which have been so kind to me this week. Between 7am and 10 am myself and Mike landed 20 good conditioned fish all on glo bugs fished under heavy bombs. In general the size of fish were a little down on what I had hoped but there were good fish mixed in them. Have a look a the condition of this 5lb jack which hadÂ a gut full of Koura!! Koura eating trout are so nice in flesh colour and quality and I cant wait to see what the smoked result will taste like. This fish gave a great scrap and stripped line with ease on many occasions before being expertly netted by Mike just before disappearing down the rapid. Throughout the day we caught another 10 fish from the braided area using small naturals in the clearing conditions. 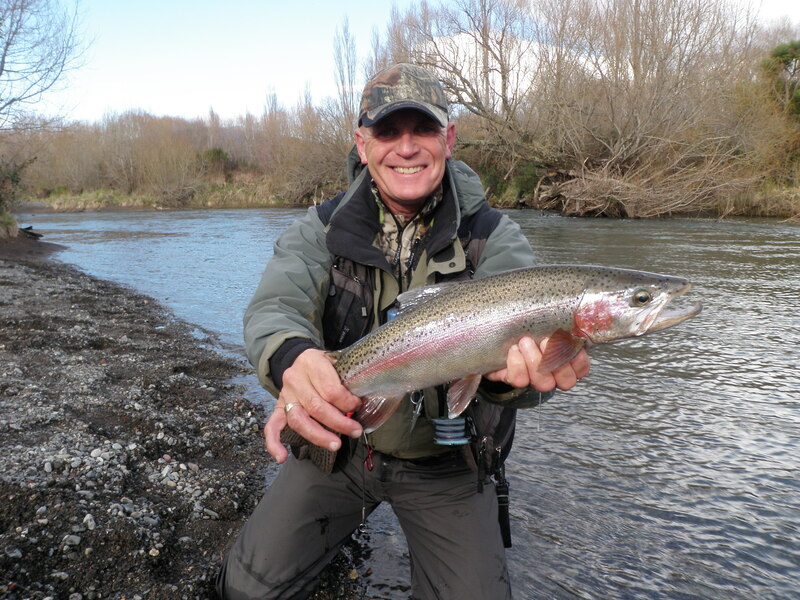 The Tongariro has had another good surge of browns as I lost two of the buggers while sight fishing to them in the Plank pool using white caddis patterns from Brian Topp. 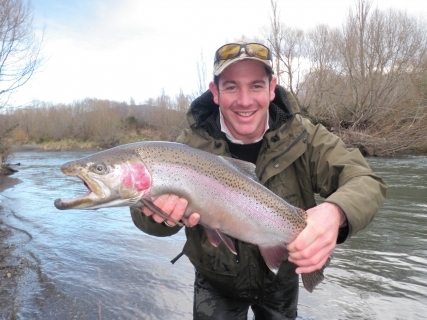 All in all the Tongariro is in great condition and the fish are nice and big just in time for the comp this weekend against the Waytoohardanuie boys, they must be shaking. Im out with Vic in the morning making sure he is up to date with best hunting areas and what to use for the big fish to take out the trophy, will keep you posted. The time is now people. May your waders never dry! !